an interview with Francis Schaeffer1. 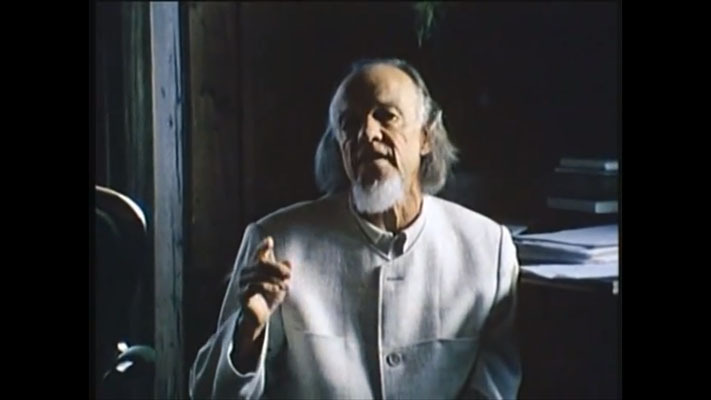 Francis Schaeffer, Christian philosopher, author and theologian, is a notable spokesman to Christians regarding the impact they should have upon, the society around them. Dr. Schaeffer and his wife, Edith, are founders of L'Abri Fellowship in Switzerland through which the lives and minds of countless people have been touched. They have authored numerous books concerning the reality of God's existence and His active involvement in our lives, the most recent of which are The Tapestry, a thorough history of "the life and times of Francis and Edith Schaeffer" written by Edith; and A Christian Manifesto, Dr. Schaeffer's most definitive statement of a Christian 's responsibility to stand courageously in the midst of a declining and increasingly hostile society. The publication of this interview with Dr. Schaeffer on that topic coincides with some significant events in his life: the release of A Christian Manifesto and also his seventieth birthday - somewhat of a miracle in itself in light of the courageous battle he has waged against cancer over the last three years. We are honored to publish the insights of this great man of God. NW: What principles do you think Christians should keep in mind as we relate to the society in which we live and attempt to make on impact upon it ? FS: I think that we ought to understand two basic elements. The first is the matter of attitude. Long ago, when I was first wrestling with the practical implications of relating effectively to society I saw something in the Scripture after much struggle and prayer. I saw that after we become Christians, our primary responsibility is to affirm the existence of God by exhibiting His character. This, of course, does not set aside the priority of the Great Commission to go into all the world - it includes that commission. As Christians, in everything we do we should exhibit the character of God. Scripture clearly states that God is holy and God is love. Our task, then, is to exhibit these two characteristics in all of our relationships, including our personal struggles, our theological wrestlings, the problems that arise in our local churches and the situations we face in our society as a whole. After much struggle back in the years before L'Abri was founded, I saw that you could say you were exhibiting the holiness of God and you would only be harsh and hard. On the other hand, you could say you were exhibiting the love of God and only compromise yourself. I also saw that you could exhibit humanistic imitations of either of these characteristics. But what you can't do in your own power - even in a poor way - is to show both God's love and His holiness simultaneously. That can only be done through the work of the Holy Spirit in our lives. By God's grace we must exhibit both the love and the holiness of God simultaneously, so that we neither compromise the faith nor merely become hard or harsh. If that has ever been necessary for Christians, it is necessary now as we enter a real phase of struggle for our country and its culture. That balance of love and holiness is our first priority. Terrible pressures and hostilities may be leveled against us by those in society who would oppose Christianity, and the tremendous temptation would be to reciprocate in kind with hostility or harshness. But we must have a mentality to exhibit both the love of God and the holiness of God. Secondly, we must recognize what I would call the "hierarchy of truth." All genuine truth is true, and all truth is important, but not every truth is as central as other truths. We must be careful to put our greatest emphasis on the central issues - or we will lose the whole battle. A good illustration of a central issue, I believe, is the issue of abortion. The biblical view of abortion - and what has been the Christian view of abortion from as far back in Church history as the early church leader Tertullian and the writings of the Didache - is one of clear-cut opposition to abortion. If we are going to fight the battle for our culture and our government at this present time, then we must ask all Christians to stand together on this clear, central issue. On the other hand, when we approach secondary issues, for example a political issue such as the ratification of the Panama Canal treaty, we must realize that Christians will differ quite honestly in their views, and accept that fact since such issues are on a different level of importance. They are not central issues in the way abortion is, and we must not confuse these two levels of importance. I would say that understanding these two points - exhibiting God's love and holiness and focusing on the central issues - will be a key to approaching our society in an effective way. NW: Why do you believe that abortion is a central issue for Christians ? FS: I think that abortion is central to our battle against the humanistic mentality we are presently fighting because, from the Christian perspective, we see an unbreakable link between the intrinsic value and dignity of human life and the existence of a personal God. If God is there, human life has intrinsic dignity as His creation. No other philosophy, no other religion, provides an intrinsic dignity for the human being. If God isn't there, human life doesn't have such intrinsic dignity. We must understand that the humanist mentality - which denies God as the reason for our dignity - has gradually been intruding more and more into the schools and the media. With the abortion ruling by the Supreme Court in 1973, the consequent shift in society in the direction of materialistic humanist thinking became a matter of life and death. At that point abortion became a central issue to each one of us and to the whole culture, for it concerns the value of human life. Therefore if the legality of abortion is allowed to stand in our country, and if the humanist attitude toward abortion continues to be a dominant one in the media and society at large, we will witness a destructive erosion in all society. We know that God is there and we are made in His image. If the humanist position is allowed to stand, however, it will reduce society's conception of human life to one that sees people as merely a part of some material continuum. This would be the most damaging attack the humanists could ever make against the Christian claim that there is a personal God. For this reason, the whole issue is of extreme importance. Furthermore, if you devaluate human life, the process will not be static; it will not stop at abortion. Evidence of this is the fact that even though it is still illegal to commit infanticide (letting a baby die after it is born), it is common knowledge that infanticide is being practiced anyway, and there is no wave of protest against it. We already hear talk about euthanasia - "mercy killing" - of the elderly. Acceptance of this is not just opening the door to the killing of the aged; it is also lowering the whole view of human life. We must never forget that in Germany prior to Hitler this kind of lowering of the view of human life from a legal and medical perspective, especially in the matter of abortion, helped make it possible for that society to accept euthanasia, not just of the aged, but of anyone who stood in the way of the state. What we must make clear is that the materialistic humanist view of the final reality leaves no real reason why any individual or any group cannot be "removed" if they are considered a "nuisance to society." So abortion really stands as the crucial point. If the Church of the Lord Jesus Christ, if those of us who really believe the Bible, do not stand and do not fight at this point, I don't think the Church will get another chance to fight. From here on I don't see where we will get another chance to reverse our society from the direction it is going. Abortion is the central issue for the Church in this time. NW: Many Christians believe that we should not get involved in the social and political realms because such involvement is: not a "spiritual" activity; it is "secular." Such a conviction has often prevented the Church from making an effective impact on society. How do you think that kind of thinking developed in the Church? FS: As far as reformation Christianity is concerned, we can trace this false view of spirituality - making a false division between the spiritual and the natural - back to the birth of Pietism in the 17th century. First let me say that I have great sympathy for the people who brought this movement forth, because the church at that particular time was very cold, and Christianity was often merely a doctrinal statement with very little emphasis on the practicability of faith in daily life. So I want to emphasize that there is a good side of Pietism. One of the most positive elements that came out of this movement was the understanding that every doctrine has some meaning in the daily practice of our lives. No doctrine is without implications in our behavior. The realization of the connection between faith and life is a good side of Pietism, and all Christians ought to be Pietists in its best sense, because Christianity is more than just a set of abstract intellectual statements. But the bad side of Pietism is that from the beginning it downplayed the body as opposed to the soul. It de-emphasized the intellectual qualities of Christianity and the wholeness of life and of reality. What developed was a spirituality that could be summed up by saying, "We should be interested in the soul and not the body" - and the division between "spiritual" and "secular" extended from there. As a result, spirituality became something "way up there" somewhere, and everything else was considered "worldly." But according to the Bible, this is exactly the wrong view of spirituality. According to the Bible, God made everything; God made my body as well as my soul. Jesus' death results in the raising of my body from the dead. Paul emphasizes in 1 Corinthians chapter 15 that if there is no resurrection of my body, then Christianity is a total failure and untrue. Certain things are sinful and are clearly stated to be so in the Bible. It doesn't say we don't do these things (because we are sinners), but it says we shouldn't do them. But after we remove these things from our lives - things that are specified as sinful according to the Bible - then everything else is spiritual. To deny this and to fail to live it is to devalue the lordship of Christ. God has made everything, Christ has redeemed everything, and in this life, by God's grace, Christ ought to be Lord of my whole life. The extent to which I restrict His lordship to only a portion of life dishonors Christ. I would go even further to say that not only is all of life spiritual, but all of life is equally spiritual. Christ ought to be Lord over all of life, and this very much includes the area of my responsibilities as a citizen of my country. NW: Would you also say that His lordship applies to education, the arts, entertainment, government and every other field of endeavor ? FS: Everything. The problem is that everything can also be misused - and obviously the arts and entertainment have often been misused. They are not automatically good; they are neutral in the sense that they can be made good or bad. Therefore, the arts can be the most destructive force you can imagine when they have a humanistic world view operating through them - which most of TV has, for example, as we can see in the thousands of ways such a view comes across on the TV screen. The plays on Broadway very often display this humanistic viewpoint as well, putting forth relativism and pluralism (that is, the bad sense of pluralism which says, "anything goes"). So the arts can be used in a destructive way. But that is different from the concept that art as art is destructive in itself. In the same light, the idea that government is naturally dirty is a serious misconception, because it is God who has given us human government. To say that government is bad in itself is to say that something God has given us is bad. Now of course there may be "dirt" in all these areas, but we must make a great distinction between the idea of certain things being intrinsically bad - intrinsically "worldly" - and the fact that they can be used in a way that is destructive. "...I am not of the opinion that all the arts shall be crushed to earth and perish through the Gospel, as some bigoted persons pretend, but would willingly see them all, and especially music, servants of Him who gave and created them." In the same way, we must realize that there is no vehicle which displays the glory of God and the wonder of God as Creator as clearly as the practice of the humanities. By the humanities I mean the results of human endeavor in the area of intellectual matters and in what we usually call art. We must realize that art doesn't have to be a gospel tract to be right. "Art as art" is right - though it can be misused -and it is right because art is a reflection of God's creativity, an evidence that we are made in the image of God. We must not think that because man has revolted against God and needs Christ as his Savior that his revolt has totally eradicated the marks of his being made in the image of God. It doesn't matter who a materialist says he is - he is who he is, and he is made in the image of God. He bears some marks of being made in the image of God. No matter how far away from God these people are or how destructive they are in their teachings about the nature of man, they are still made in God's image, whether they believe it or not. This is especially evident in the arts, and by "arts" I don't mean just art with a capital "A." The man who is interested in having a well-designed room, the woman who is interested in setting a beautiful table, the person who is interested in growing a lovely garden, are also involved in the "arts." The reason human beings produce art on any level is that they are made in the image of God, and this has not been lost in the Fall. NW: In that regard, what would you say non-Christian writers and thinkers have to offer us? FS: In general, philosophy and intellectual thinking parallel the arts in the sense that even non-Christian philosophers and thinkers, like non-Christian artists, still bear the image of God. Many non-Christian thinkers have thought through to the central problems of life with great clarity, and they have understood those problems deeply. However - without knowing the central reality of the Judeo-Christian God, without knowing His existence or revelation - these philosophers cannot arrive at sufficient answers intellectually or spiritually. They can define the problems of Man very well and they have bits and pieces of true observation, but what they can never do is to give us accurate, sufficient, intellectually complete answers on the basis of their knowledge and perspective. NW: Would you say, then, that it is appropriate for Christians to study non-Christian literature? FS: I have learned a great deal from studying non-Christian writers and seeing how they define the problems of life. After I read them, I ask myself, "Well, what are the Christian answers to these questions?" Through both writings and art forms I see many problems presented for which the writers and artists themselves have no answers - and yet they have a certain sensitivity to particular areas of the human dilemma and the human condition. Our minds are sharpened by examining the questions these people raise and then going to the Bible to see what the answers are in the total Christian biblical framework. Unfortunately, Christians often have not even thought of the problem, much less the answer. One last point is important. We must be very careful to understand that our fight is against humanism, not against the humanities - human creative endeavor. The false spirituality that we talked about before would automatically be against the humanities, but that is a wrong attitude. Because the humanities are a product of human creativity, they are a reflection of the great Creator, and there are ways to study them which are very helpful - as long as we don't accept the final answers of non-Christian artists and thinkers. Nor are we opposed to humanitarianism, which is simply kindness to people. As a matter of fact, Christians ought to be the most humanitarian people to be found. NW: Would you say that one way we as Christians have somewhat failed is in not trying to understand the mentality of secular people in order to communicate the gospel effectively to them ? FS: Absolutely. When I first was writing The God Who Is There and Escape From Reason, I wrestled with the concerns of modem art. One thing that used to infuriate me was that when I began to lecture on modem art, showing a slide of a modem painting, the Christians in the audience would laugh. It would infuriate me because the people who painted the pictures were in agony as they struggled with the problems of life, and they portrayed this agony in their work. Because the artists' perspective was foreign to most Christians, in church after church, audience after audience, the response to the paintings was a giggle. But they should have been weeping ! Where is our compassion ? Many artists and thinkers have been honest in dealing with the consequences of their world view and have had the admirable courage to carry it to its logical conclusion - which is much more than has been done by many Bible-believing Christians who superficially accept Christ as Savior and go no further. I don't mean that they are not saved, but their attitude is "Now everything's fine and we're going to heaven; that's the end of it." They go to church and sing songs to make themselves feel good. But if Christians would push on in their thinking to the logical implications of their faith, they would be out on the streets. Some of them would probably be picketing in certain situations - and they would be paying a price for their Christianity. But this calloused reaction that I found - the giggle in response to modern art - was, I believe, an indictment against the people who were laughing when they really should have been crying. If we can understand and weep with the people who paint these pictures, it will help us bring the gospel to those who share their way of thinking because we will be able to present clearly the reality of lostness from the perspective of their own artistic "prophets." We have paid a terrible price for our wrong view of spirituality, both individually and in our culture as well. In our laziness, we haven't pushed our Christian faith to its logical conclusions and had the compassion to consider just how horrible is the lostness of our modern generation. The Bible presents people without the living God as lost in two senses: They will be lost when they die in the final judgment, and they are lost in this life as well. But we haven't talked much about that. Instead we live in our Christian "ghettos" and sing our songs, and we feel good. We present our evangelism with trite little phrases. But where are the tears? Our approach has not only been unbiblical; it has been cheap. NW: What do you think needs to take place among Christians to shake us out of this kind of apathy ? FS: I think the first thing is that we need to take the Bible seriously and to understand that the lordship of Christ covers the whole of life. We must become truly spiritual instead of practicing an easy and cheap spirituality. The next thing we must do is to have the courage to look at the faces of modern culture and to realize why they are empty. We must recognize that modern art and thinking are shaped by the modern secular world view which claims that impersonal matter or energy formed by chance - not a personal God - is the final reality. That secular world view is causing a complete collapse of culture, a tremendous victory for Satan. We must understand the monster that we face in this battle and be stern as we stand against it. Finally we must realize that the lordship of Christ means we will pay the price for our faith, and we must carry our faith in practical ways into the fields where the battle against secular thought is being fought. Each of us must be willing to pay the price of commitment to the living God in our own profession and sphere of responsibility, regardless of what that price may be. When we are willing to pay that price, then we will truly be living on the cutting edge. Francis Schaeffer died at Rochester NY, May 15th 1984.